Was I only person who thought that Nip + Fab consisted of products were purely for things like cellulite and wrinkles?! Seriously where have I been? Tut, tut to me and my beauty brand sterotyping! Turns out this cheeky little brand has got a whole range of products out ranging from shower treats to skincare to make-up ... and make-up is what I'm chatting about today! You may have spotted these recently in my Minimal Summer Make-up post - read here! So.....BB creams/products never really took my fancy that much but... CC creams, well that is a different story! I've bought a few over the past year and have been so pleasantly surprised I'd say everytime. Where I'm used to wearing a high coverage foundation daily so it's a lovely feeling to wear something that still have great coverage but is lighter on the skin, especially in this hot weather! Not only does it have a 30SPF which, for me, is essential for summer but it only contains Soline & Hyaluronic acid to keep your skin super moisturised for 24 hours! Keeping your skin hydrated is key in the summer, my skin can feel so drained of moisture after just a few hours especially when I am down the beach, so this stuff is a life-saver. If you are like me, someone who can't bare not putting on a base but can't stand having a melted face of foundation then you will love this! When I first saw the shade I was a little nervous it looked slightly orange ...BUT once I had applied and blended it in it sat perfectly and gave me a smooth and radiant finish without feeling thick or heavy. The concealer eye fix works perfectly with it aswell. Now this isn't an 'eye fix' that is going to cover your dark circles like a heavy duty concealer (aka Seveteen's Phwaorr Paint) but it is going to conceal them. This clever stuff is filled with light diffusing pigments which help brighten to under eye area and also life the eye area appearance! Keeping with the CC cream's benefits this stuff also locks in moisture with it's special beeswax ingredient and it also has one of my fav little treats included... vitamin E! I love the twist applicator and have really been enjoying using this alongside the CC cream for a simple everyday face! These two are definitely top of my summer make-up list and have helped me wave goodbye to thick and heavy foundations for times when they are total unnecessary! 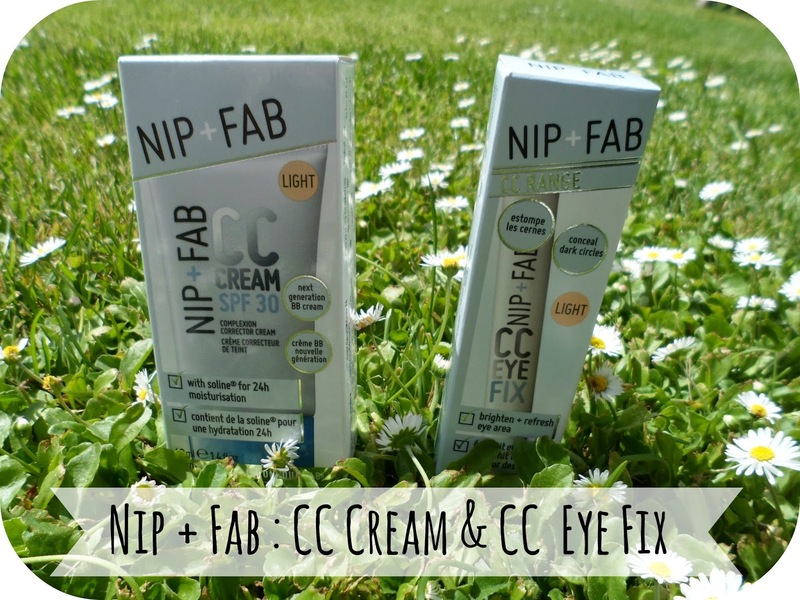 The eye fix is priced at £9.95 and the CC cream - £14.95. Have you tried anything from Nip + Fab recently? I have a huge wishlist and would love to know if you guys have been loving anything!! It's not a brand that I'm familiar with but I'll keep an eye out for them now. I never seem to get eye brighteners quite right. Oooo I want to try the CC cream, foundation is too heavy in this weather!